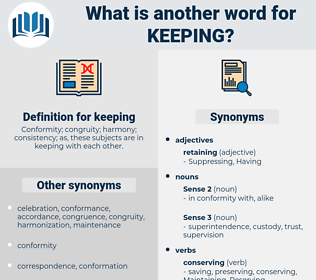 What is another word for keeping? Maintaining, books, maintain, preserving, maintenance, Sustaining. considerations, peacekeepers, Schedules, uniforms, reasons, maintenance. Maintaining, maintain, rearing, preserving, maintenance, Sustaining, raising. retained, Upheld, Remained, reaffirmed, Captured, Detained, deducted, Contended, opted, Argued, Attracted, attached, ruled. 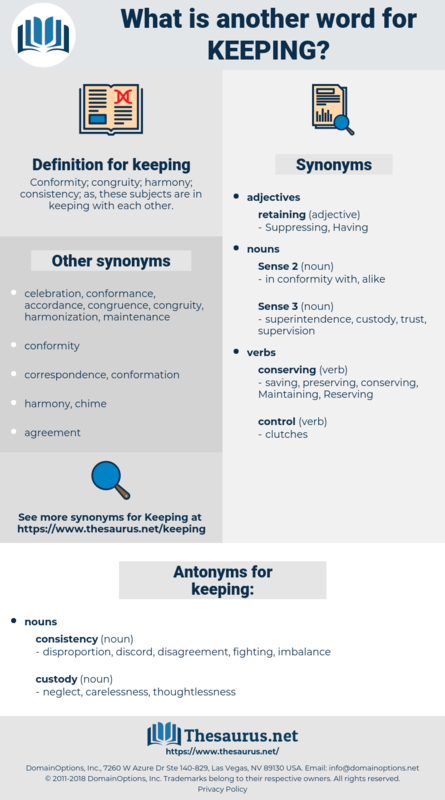 peacemaking, Perpetuating, protecting, remaining, persisting, stockpiling, update, updating, Incorporating, information, implementation, impeding, sticking, Preventing, Prosecuting, Furthering, report, Checking, expenditure, Guaranteeing, supervising, alternative, Precluding, principle, Adhering, minimising, speaking, Excluding, observing, Eliminating, emphasising, stopping, agreement, replacing, Preparing, Restraining, opening, Acknowledging, follow, following, minimizing, leaving, Possessing, Enshrining, Eradicating, recosting, emphasizing, principles, Proposing, Avoiding, pending, Everything, Indicating, Removing, Capturing, performing, abiding, implementing, stabilizing, striking, proceeding, being, supporting, correspond, corresponding, concealing, Separating, Proving, Expressing, understanding, Producing, Prolonging, moving, always, Suggesting, respect, Respecting, accompanying, restricting, approving, inspiring, withholding, integrating, encourage, encouraging, expelling, follow-up, underscoring, Establishing, collecting, Reiterating, organising, writing, complying, Translating, Managing, undertaking, Reserving, Facilitating, Responding, Experiencing, balancing, reminding, recalling, provide, Providing, Restoring, confining, measuring, Depending, Formulating, Mitigating, accepting, Considering, defending, Memorizing, response, imposing, Enforcing, Presenting, guarding, operating, conforming, upcoming, Replying, monitor, monitoring, upgrading, adjust, Adjusting, confirming, Generating, advancing, increasing, helping, enabling, Introducing, converging, phase, assuring, identifies, complete, completing, informing, warehousing, putting, constraining, Assessing, Depositing, Liaising, insert, maintaing, Addressing, highlighting, Receiving, tightening, Containing, hindering, Banishing, Adapting, becoming, contributing, changing, Pertaining, Recognizing, tracking, hiding, presence, paying, Achieving, satisfying, withdrawing, connecting, Detaining, Deducting, hanging, handling, losing, Resisting, Overseeing, recording, setting, sets, Enjoying, Creating, transmitting, engaging, insisting, spending, lengthening, issuing, braking, Whenever, exercising, reducing, honouring, caching, rendering, takes, rehousing, Denying, neighbouring, Implying, briefed, Occupying, cleaning, Securing, underlining, Registering, reviewing, Selecting, attending, seizing, decreasing, Realizing, settling, Requiring, Behaving, pursuant, regards, Waging, Noting, notes, diminishing, equal, stressing, Adopting, shortening, framework, watching, Permitting, Evolving, seeking, rising, waiting, hooking, Propping, using, enrolled, Enrolling, reflecting, cleansing, blocking, drafting, ensuing, mastering, Placing, Submitting, Involving, fostering, approaching, Residing, i.e., Refusing, Amending, ec, le, sending, narrowing, relevant, resolving, living, access, Discounting, working, owing, playing, steering, limiting, agreeing, lessening, sitting, us, lowering, looking, renewing, tibet, Witnessing, facing, wearing, giving, core, Arising, Attempting, Relating, fixing, Resuming, spreading, day, herding, Delaying, fuelling, Rejecting, mapping, wasting, tailoring, curbing, pitting, loving, Relying, offering, \, freeing, entering, functioning, causing, bearing, Having, drawing, link, links, Linking, bring, Stemming, Applying, missing, answering, Boosting, lying, basic, urging, accounting, dealing, letting, la, Clutching, matching, resulting, joining, counselling, den, Extending, Assisting, showing, logging, me, feeling, serving, halting, tune, tuning, going, failing, Adding, tending, allow, Allowing, Amounting, wrapping, according, accords, seeing, turning, heading, reaching, standing, thinking, Aiming, focusing, Basing, controlling, getting, Got, grant, leading, lasting, falling, signing, cutting, laying, making, listing, Forming, What, Maintaining, Doing, line, meaning, trying, acting, willing, run, maintain, rearing, preserving, Sustaining, peacekeeping, raising. disproportion, discord, disagreement, fighting, imbalance. transferal, infraction, overlooking, disregard, delinquency, breach, challenge, sin, violation, dereliction, brush off, offense, wrong, relinquishment, nonobservance, Flouting, trespass, dispossession, disorder, infringement, contravention, transgression, defiance, rebellion.
" What do you mean," he said, " by keeping a girl of that kind in a place like this?" The way they seemed keeping watch on each other.